Chile has been described as a "long and narrow strip of land" that stretches north to south trapped between the Andes Mountains and the Pacific Ocean. One of its most distinctive features is the great diversity of climates, ecosystems and landscapes that fascinate both locals and foreign visitors. The explanation for this lies in the enormously different latitudes within the country, which extends over 4,200 kilometers from its northern border with Peru and Bolivia to Cape Horn in the south. If we add the Chilean Antarctic Territories, the country can be said to stretch incessantly as far as the South Pole. The variety of climates is also enhanced by Chile's Pacific territories, the most important of which are Easter Island and the Juan Fernandez Archipelago, where temperature and humidity levels are akin to the rest of Polynesia. Another feature that varies tremendously depending on the latitude is the rainfall. The further south one ventures, the greater the rainfall tends to be. In northern Chile, there exists a meteorological phenomenon known as the ¨Altiplano winter¨, caused by high summer temperatures that lead to a build-up of rain clouds that discharge as they clash with the condensation produced by the cold mass of the Andes Mountains. Coming westwards down from the Andes, the most prominent feature is the midland depression, followed by another series of mountains known as the Coastal Range (Cordillera de la Costa), until one eventually reaches the sea. South of the river Bio Bio lies an area of special interest for tourists and holidaymakers known as the Lake District, characterized by the presence of numerous active volcanoes. This environment remains constant as far as the city of Puerto Montt, which is the point where the central valley sinks into the sea to create an archipelago made up of nearly 5000 islands. The next regions after that point are Chiloe and Aisén, which form the gateway to Patagonia, an extensive territory that belongs to both Chile and Argentina. In the cold, rainy region of the Patagonian channel, a multitude of glaciers slide directly into the sea, breaking up to form innumerable ice-floes, which makes for the most extraordinarily beautiful spectacle thanks to the contrast with the exuberant vegetation surrounding them. An especially prominent feature in the southern mountain range is the presence of two enormous Patagonian Ice Fields. The Northern Patagonian Ice Field is situated between Lake General Carrera and the Gulf of Penas and runs north-south for nearly 100 kilometers with an average width of 40 kilometers. There exist numerous glaciers that run into the sea or low altitude lagoons. The most famous of these is the San Rafael Glacier, the significance of which lies in that it is the nearest sea-discharging glacier to the Equator (46°40' S). lmmediately after the Gulf of Penas lies the Southern Patagonian Ice Field, which, with its length of nearly 350 kilometers and width of between 40 and 60 km., is the largest glacier landmass in the southern hemisphere outside the Antarctic. 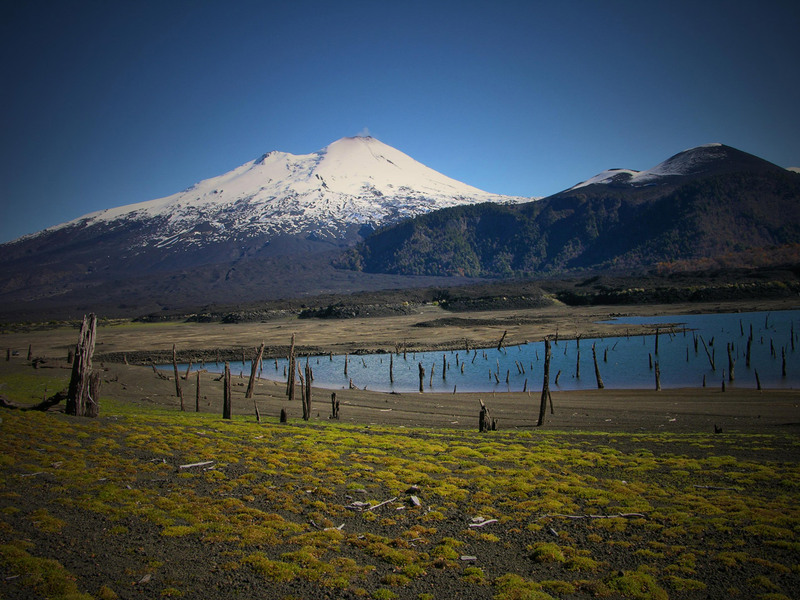 The most famous glacier in this area, the Pius XI, is also the most extensive and is situated on the busiest cruising circuit in the south of Chile. Another characteristic of the Andes Mountains is how the range gradually loses altitude the further south one goes. Mountains of over 6,000 m in height are frequent in the north of Chile and also in the centre but die out south of the area opposite Santiago. A little further south one can still find some peaks of over 5,000 meters but there are none in the Lake District, while in Patagonia Mount San Valentin (3,910 meters) is the highest summit.